Actually, I tried several “shots” of the moon, and this one is the best of the lot . . .
Not a prize winner, but a good learning experience for me, and a much better photo than was my first Sun Shot. I’ll be doing more Sun shots soon, taking advantage of what I have learned about both the camera and the telescope over the past several days. 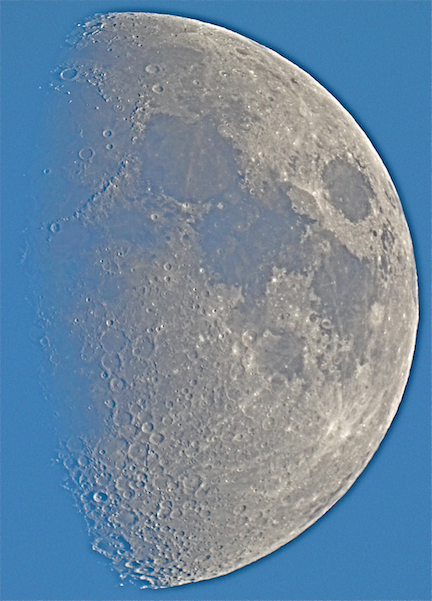 This photo of the moon was taken about 1900 PDT, while it was still full daylight, thus the blue tinge to the photo. 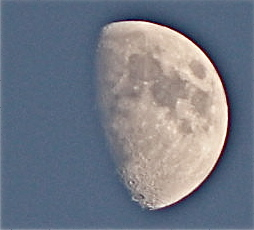 I also tried taking a photo of the moon using the Canon 55-250 telephoto and captured the image shown below . . .
Not as much detail as with the Orion telescope, but not bad for a hand-held snapshot. We are planning to attend another “Astronomy Night” at Lake Casitas next weekend (Saturday, 01Sept 2012) and will take the telescope and camera for some star gazing after the “Farewell to Summer Stars” presentation by NASA accredited astronomer Ernest Underhay. His presentation on 11 August preceding “Meteor Shower Night” was informative and entertaining, and we are looking forward to another enjoyable evening with Ernest and fellow “back yard astronomers” who will be there. Remember to look up now and then – there is a very large universe for you to enjoy there. This entry was posted in Astronomy and tagged astrophotography, lake casitas, moon. Bookmark the permalink.